"A good recipe for burritos, tacos, enchiladas, and all your favorite Tex-Mex foods. Freezes well in heavy duty plastic freezer bags." Heat the oil in a large skillet. Brown beef cubes for 10 to 12 minutes. Reduce the heat, add the garlic, salt and cumin. Cook another 15 minutes. Add the can of tomatoes and heat to a boil. Reduce heat to simmer, cover and cook for 1 1/2 to 2 hours. Add water to the skillet as needed to keep the mixture from boiling dry. When cooked very tender, cool, then shred the meat using 2 forks. Place back on heat and stir until most of the liquid has evaporated. If planning to freeze, cool before packing in freezer bags and placing in freezer. 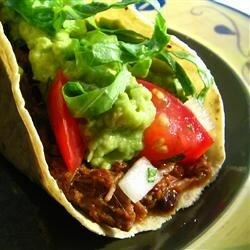 For soft burritos, top a warm flour tortilla with the meat mixture, salsa, and grated cheese.